BENGALURU: The New Year began on a momentous note for cardiac patients in Bengaluru as doctors in the city performed a live heart transplant on Saturday. Coordinating with several agencies, doctors placed the heart of a 21-year-old flower merchant inside a 29-year-old goldsmith from West Bengal. 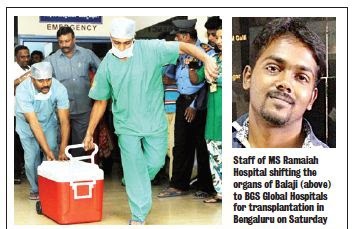 Doctors at BGS Global Hospitals and MS Ramaiah Memorial Hospital were involved in transplanting a live heart in an operation that lasted two hours and 45 minutes. On Thursday, flower merchant Balaji and two others were on a motorbike when they met with an accident. Balaji, who suffered a severe head injury, was rushed to hospital. He was declared brain-dead around 7 pm on Friday. His mother volunteered to donate his organs. The Zonal Coordination Committee for Organ Transplantation in Karnataka identified a goldsmith from Hoogly, waiting for a heart transplant for two months, for the donation. “The patient is doing well,” Dr Anand Subrahmanyam, senior cardiac surgeon at BGS Global, said. Not many patients are aware of the transplant option. Fortunately, there is growing awareness, he observed. The goldsmith was diagnosed with heart failure symptoms three years ago, and was unable to work and support his family. Doctors from West Bengal referred him to Bengaluru. He arrived two months ago and was on the waiting list. Medical Team The transplant was performed by a team of 15 senior cardiac surgeons, including Dr Anand Subrahmanyam, Dr Manoj S P and Dr Bharath Dubey. A transplant surgery requires a team of highly skilled surgeons, technicians, infrastructure and diligent coordination, Subrahmanyam said. “The patient requires to be on intensive monitoring for rejection and infection, and immune suppressive drugs are administered to prevent the body from rejecting the new heart,” he said. The patient will be discharged in eight to 10 days and will need to take extreme precautions against infections, while also taking immune suppressive drugs for over a year, he explained. K U Manjula, Chief Transplant Coordinator, said, “We spoke to the family and made them understand that they get no money for their service. At 7 pm on Friday, we took a second declaration and got the mother to sign papers. His heart, kidneys, corneas and liver were donated.” As on Saturday, 1,477 patients were on the waiting list for heart transplants. Doctors look for many things, such as blood group and body weight, to match before replacing a heart. A transplant cannot be done between an adult and a child, and in multi-organ infection cases (cancer and HIV). Bengaluru has helped two other transplants in the recent past. In September, a heart was sent from BGS Global to Fortis Malar in Chennai. Another such transplant, to the same hospital in Chennai, was facilitated by Manipal Hospital in December. Correction: An earlier version of this story incorrectly described the surgery as the city's first live heart transplant.